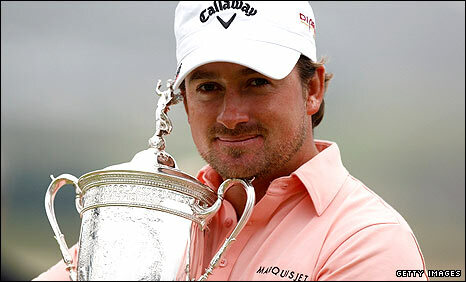 Graeme McDowell became Europe's first US Open champion for 40 years when he clinched his maiden major title in impressive fashion at Pebble Beach. The Northern Irishman won by one shot from France's Gregory Havret with Ernie Els two behind in third and Phil Mickelson and Tiger Woods tied fourth. McDowell, 30, came from three shots behind overnight as third-round leader Dustin Johnson imploded early on. England's Tony Jacklin was the last European winner at Hazeltine in 1970. "It's an absolute dream come true, I've dreamed about this all my life," said McDowell, who won his fifth European Tour title in Wales two weeks ago. McDowell, who was second overnight, regained a share of top spot when playing partner Johnson dropped three shots on the second hole and, as the American fell further behind, the European Ryder Cup star was never again headed. The Portrush native, who went to college in America, becomes the first Northern Irishman to win a major since Fred Daly clinched the Open at Hoylake in 1947. And he is the first player from the United Kingdom to win a major since Paul Lawrie triumphed in the Open at Carnoustie in 1999. McDowell, who also led after round two, shot a final-round three-over 74 to finish on level par as Havret, bidding to become the first French major winner since Arnaud Massey won the Open in 1907, carded 72. Two-time US Open champion Els fired a one-over 73 to end on two over, while the world's to two players, Woods and Mickelson, could not emulate their rounds of 66 in previous days and ended with 75 and 73 respectively for three over. The 25-year-old Johnson, the winner of the last two PGA Tour events to be held at Pebble Beach, also double-bogeyed the third and went on to card 82 as McDowell took up the reins. The world number 37 was briefly joined by Els at three under but moved into a two-shot lead after his only birdie of the day on the fifth. With a stiff breeze blowing across the testing links on the edge of the Monterey Peninsula, scoring was tough on the back nine and none of his rivals could mount a serious challenge. McDowell dropped four shots from the ninth, including a bogey at the short 17th, but took a one-stroke lead down the par-five last. And when Havret missed his birdie putt up ahead, the Florida resident played conservatively to give himself two putts to win the title. "It's so difficult to win a golf tournament, let alone a major. I'm just so thrilled to get over the line," he said, hugging the silver trophy on the 18th green. McDowell's final round was the highest score by a US Open champion since Andy North's 74 at Oakland Hills in 1985 but he joins the illustrious list of Jack Nicklaus, Tom Watson, Tom Kite and Woods as US Open winners at the iconic California course. Woods, who won the last US Open at Pebble Beach by 15 shots, was chasing a 15th major title after lighting up the tournament with a third-round 66 to roar back into contention. But after five months out of the game following a scandal in his private life, the 34-year-old could not sustain the challenge and instead made six bogeys in his first 12 holes. A birdie at the tricky 14th gave him hope of a late fightback but he parred his way home to match his fourth place at the Masters in April on his reappearance from the lay-off. 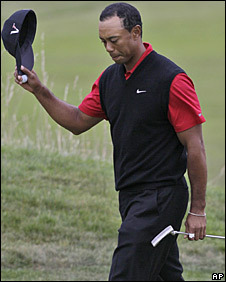 "It's disappointing because I started off so poorly again," said the three-time US Open champion. "I really didn't too many bad shots. I just left myself in the wrong spots." Woods, who parted company with swing coach Hank Haney following the Masters, did admit that his overall play at Pebble Beach gave him encouragement for the future. "I feel like I put some pieces together this week," he said. "It's a process. It's a long process, but I've put some of it together, and I hit some shots this week that I haven't hit in a long time. "The two major championships I finished I had a chance to win both of them. So it's not too bad." Mickelson was chasing a first US Open title following a record five runner-up spots to add to three Masters Green Jackets and a US PGA victory. But the 40-year-old left-hander could not find the same spark that saw him romp to a 66 in the second round and after starting with a birdie he dropped three shots coming home to miss out on the victory that would have seen him overtake Woods as world number one. "I thought when I made that putt on the first hole, it was going to be a great day," said Mickelson. "When you saw Dustin make a triple [bogey] early on you knew it was anybody's ball game." Havret, who came through 36 holes of qualifying at Walton Heath to make his first US Open, said: "I'm caught in between the best surprise of my life and the biggest disappointment too. "I'm second, which is probably the worst place, but it's such a dream to play good golf here, four rounds beautifully." Els, who won the US Open in 1994 and 1997 and the Open in 2002, picked up three shots in his first six holes but saw his challenge falter around the turn with a spell of bogey, double-bogey, bogey from the ninth. A further birdie at 12 gave him hope but two more dropped shots at 14 and 17 proved the difference. The 40-year-old has endured some lean years following a knee injury but two wins on the PGA Tour this season suggest he may yet add to his major tally. Watson, the 1982 champion, paid a tearful farewell to the tournament on the 18th green in what will probably be his last US Open after receiving a special exemption to play at the age of 60 following his runner-up spot in the Open at Turnberry last year. "There were a lot of emotions going on there on 18," said the eight-time major winner, who finished tied 29th at 11 over after a closing 76. "It was done somewhat with smoke and mirrors and a lot of experience playing Pebble Beach." The much-anticipated English challenge did not materialise this week as world number three Lee Westwood (71) ended eight over, Paul Casey (78) was 13 over and Luke Donald (78) finished 14 over alongside Ian Poulter, who also took 78. Ireland's three-time major champion Padraig Harrington carded 73 to finish nine over, while Wales' Rhys Davies shot 76 for 19 over. The Open Championship, the year's third major, is set for St Andrews in Scotland from 15-18 July.